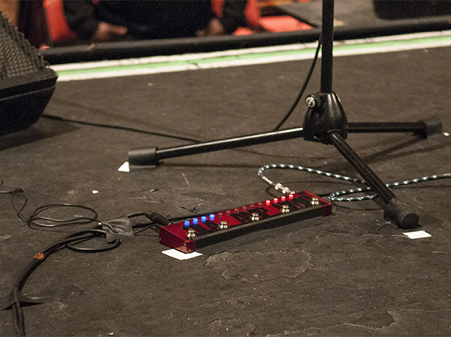 For the bulk of his 2014 tour with the Winery Dogs and his recent solo tour, Richie Kotzen was using the final prototype of his RK5 Signature Fly Rig. Countless sightings and questions were posted in social media by fans wanting to know about the mysterious red pedal. After an intense, year-long collaboration, the Richie Kotzen RK5 Signature Fly Rig is now available. While Richie uses his RK5 in conjunction with his standard amp set-up, this sleek, compact unit embodies an entire rig on its own. The RK5 offers the same essential assortment of features as the Fly Rig 5. At its heart, is the all-analog SansAmp™, which makes it possible to go direct to a PA or mixer. Effects include a reverb voiced to create the rich ambiance of a vintage spring reverb; a delay with tap tempo and adjustable tape drift-style modulation for authentic textures; a powerful boost with up to 21dB of additional pre-amp gain, which operates independently to punch up any of the other functions. The Richie Kotzen RK5 Signature Fly Rig sports a red anodized finish, measures less than 12 inches wide and weighs less than 19 oz. It is perfectly sized to pop into your guitar case or backpack and head for the door. More info on this beast in a box can be found at Tech 21’s website.